POINT LOOKOUT, MO. 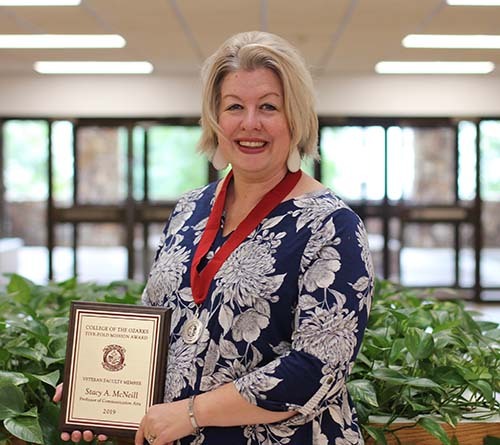 — Stacy McNeill, professor of communication arts, received the College of the Ozarks Veteran Faculty Member Five-Fold Mission Award at the 2019 awards assembly on April 3. McNeill has served 17 years at the College and is known by students and faculty members as an engaged and involved professor who lives out the relational skills she teaches. She is chair of the performing and professional arts division and sponsors the C of O Public Relations Club. McNeill holds a Bachelor of Arts in mass media from College of the Ozarks, a Master of Arts in communication from the University of Arkansas, and a Doctor of Education in educational leadership and policy analysis from the University of Missouri. In addition to regular administrative and teaching duties at the College, McNeill fulfills a variety of service roles for the institution. She has trained both full-time and adjunct faculty, participated in campus forums, and authored a piece on civility and public discourse for Faithful Lives, a journal produced by the College. McNeill also speaks and volunteers at several campus events each academic year. The C of O Veteran Faculty Member Five-Fold Mission Award is given to a veteran faculty member who has worked at least seven years at the College and whom students and co-workers recognize as best embodying the College’s academic, vocational, Christian, patriotic, and cultural goals.